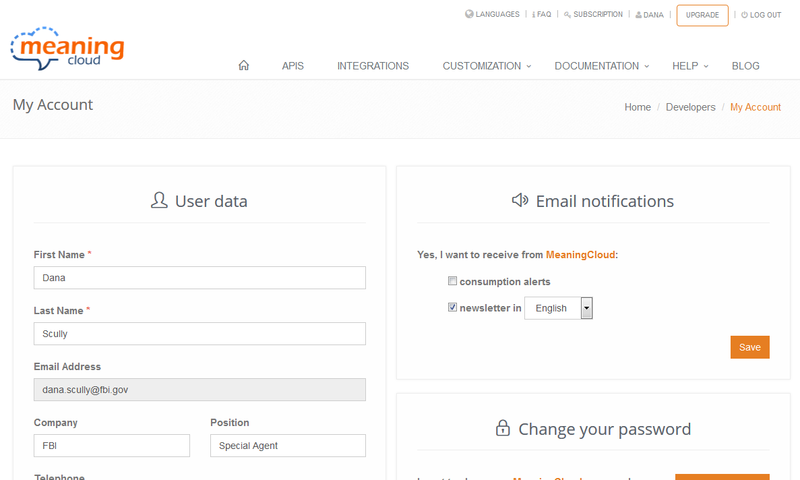 If you haven't already, create an account in MeaningCloud. Request access to any pack you may want to use in your analysis. Add the license key to the Excel add-in. In order to get a license to use any of our products you need to have an account in MeaningCloud. It's a very easy process, you just need an email account and to fill in the fields you'll find in this form. When we receive the filled-in form, we will send you an email to the account you've provided (it should be almost immediate, so if you don't receive it, make sure to check the Spam folder). In said email, there will be a confirmation link; when you click it, you will confirm your account, and will be logged into MeaningCloud and redirected to the developer's home. Requesting the 30 day free trial period that we offer for all our packs. Suscribing to the pack you are interested in. To start the trial period of any of the packs, you just have to log into MeaningCloud, find the tab called "Our packs" and click on the corresponding ‘Start trial‘ button. If you have already tried the pack and you want to keep using it, you will need to subscribe to it. In the same way you can choose which plan you want to subscribe depending on the credits, rate limit and resources you need, all the public packs are now included in the upgrade process. All the resources that are part of any of our vertical or language packs appear with the cubes icon before the name! 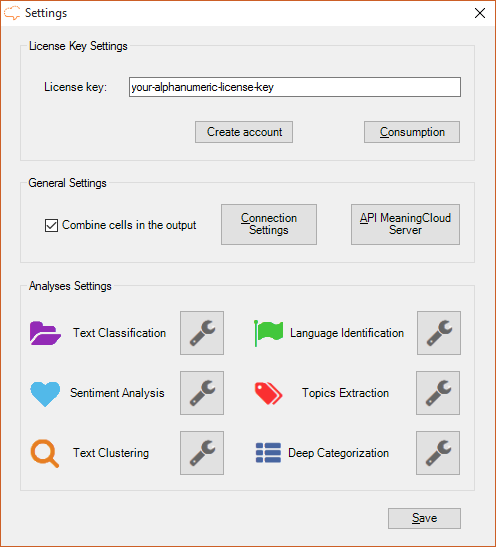 Just by creating an account in MeaningCloud you are assigned a license key you can use for any of our products. In order to use it with the Excel Add-in, you just have to add it to the Settings section of the add-in. This contains a text area for inserting the key of any of the services implemented in the Add-in. 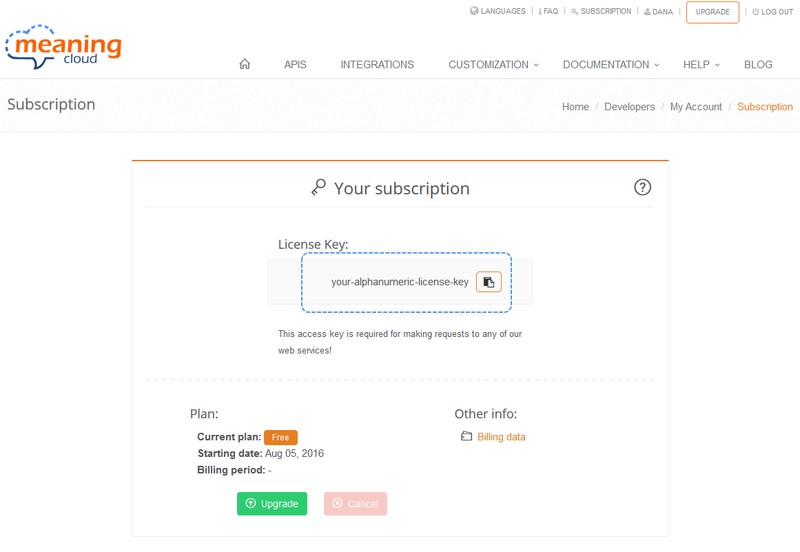 You can copy your key either from the Subscription section, or from the developers home. Once copied, you just have to paste it into the corresponding text area. If your Internet connection is carried out through a proxy server, you will need to configure it in the add-in. This configuration is done in Connection settings. That's it! Now you have everything you need to analyze any content from the comfort of your own spreadsheet. Just click on the analysis in question, select your data and wait for the results. If you want a general overview of the add-in, you can check the Features section; if you'd rather see in detail what each analysis can do, just go to Analyses. It's important to remember that each time you run an analysis in Excel you will be consuming credits from your account. You can check your consumption in the developer's home. As usual, if you have any question or issue, we are available through our feedback form.